Feeling like your social feed is lacking inspiration? We challenge you to refresh your feed in Santa Barbara. Not only will you go home feeling refreshed too, you’ll have treated your followers to a case of FOMO (fear of missing out), giving them a reason to stop scrolling to ‘like’ each of your travel photos. No need to be a serious hiker to get the photo-worthy rewards of these two top-notch Santa Barbara hikes. For those who want to kick-start their day, Inspiration Point will get your heart rate going with a moderate 3.5 mile trek, giving city and coastal views and a dose of inspiration lasting all day long. Once reaching the top, hikers are known to use rocks to make words or symbols to leave as inspiration to fellow hikers. Lizard’s Mouth is more of a boulder hopping experience rather than trail hike. The best time to get jaw-dropping views at this favorite spot is between golden hour and sunset. Hop from stone to stone as you pick the perfect place to perch to watch the sunset over Santa Barbara. Feel on top of the world and have the photos to prove it. Once you set foot on property, don’t be shocked if you go into visual overload with the beauty that surrounds Ganna Walska Lotusland. Described as a 37-acre botanical nirvana, make sure you have enough phone storage and battery life for this visit. Prepare to leave with hundreds of photos and be forewarned, you’ll want to post each and every one of them! Thankfully, the new slideshow feature on Instagram must have been made with Lotusland in mind. Didn’t get enough flora and fauna for your feed? Not to worry. Santa Barbara Botanic Garden is another unique natural attraction filled with California native plants. Open to the public 365 days a year, you won’t need reservations to enjoy this beauty. Santa Barbara has been considered “The American Riviera®” for over a century thanks to the city’s signature red-tile roofs, white-washed buildings and lush gardens nestled between the mountains and the sea. If you’re looking to roll each of these characteristics into one frame, the Santa Barbara County Courthouse clock tower offers a vantage point unlike any other. Venture to the top (which is FREE to do), for a breathtaking 360-degree view. If you can only capture one photo of Santa Barbara, this landmark is it. Known as the “Queen of the Missions,” Old Mission Santa Barbara is not just another place to stop and smell the roses, but rather, stop and snap a few photos. Plan to stay for the afternoon to marvel at the beautiful architecture and wander the grounds. Take a self-guided tour or pack a picnic to be enjoyed amongst the roses in the garden. In May, visit during the I Madonnari Italian Street Painting Festival, to snap photos of its plaza transformed by artists with over 200 colorful chalk paintings. A selfie at Santa Barbara’s iconic dolphin fountain located at the entrance of Stearns Wharf is a rite of passage for many Santa Barbara visitors. As you make you way down California’s oldest working wooden wharf, treat yourself to a sip of Sauvignon Blanc at Conway Family Wines Deep Sea Tasting Room. The views of water and coastline are unparalleled! The Channel Island National Park is a national park unlike any other, and its beauty will take your breath away. Whether you’re hiking, stargazing from your overnight campsite or kayaking some of the world’s most noteworthy sea-caves, adventure can be had on each and every inch of this island chain. Keep your camera handy because adventure doesn’t just begin once you’re on the island. As you make your way by boat to the park, dolphins, whales and other local wildlife might greet you along the way. During spring months, Santa Barbara hillsides are abloom with California poppies. Located in Santa Ynez Valley, immerse yourself in a sea of wildflowers as you hike or drive up Figueroa Mountain. Don’t be surprised if you find yourself bursting into song as you frolic the fields, snapping photos from every angle. Catch them in bloom while you can, as this view is seriously beautiful. Feel like royalty! Channel your inner Prince William and Kate Middleton as you get ready for a day at the Santa Barbara Polo & Racquet Club. The royal couple visited back in 2011 as Prince William played in a charity match. Big hats, floral dresses and beautiful steeds are all you’ll need to document this day. If you’ve ever fanaticized about walking through a rainbow, dreams come true in Santa Barbara. Located adjacent from East Beach, the colorful Chromatic Gate is a popular landmark for visitors to walk, ride, jump and even cartwheel through. It’s all smiles at this SB landmark. A popular spot for fashionistas, make your way to the colorfully patterned, tiled stairs at Paseo Nuevo Shops & Restaurants. Each and every step is styled with Spanish tiles, making images warm, colorful and full of flair. If you’re living like a local on your trip, than tacos are a must in this foodie paradise. Santa Barbara is blessed with taquerias aplenty. While it’s hard to choose a favorite, the photo-worthy award goes to Los Agaves on Milpas Street. Set the table with mouth-watering tacos, decadent nachos, sizzling fajitas, and as many types of salsas you can carry. Our only tip, don’t let the steam from the fajitas fog your camera lens. For food that’s almost too pretty to eat, Mesa Verde more than delivers. Each artfully arranged plate looks like a masterpiece carefully created to please your palate. Vegans rejoice – all of the food is plant-based and sourced by local ingredients. We dare you to go to Mesa Verde and not take a picture. 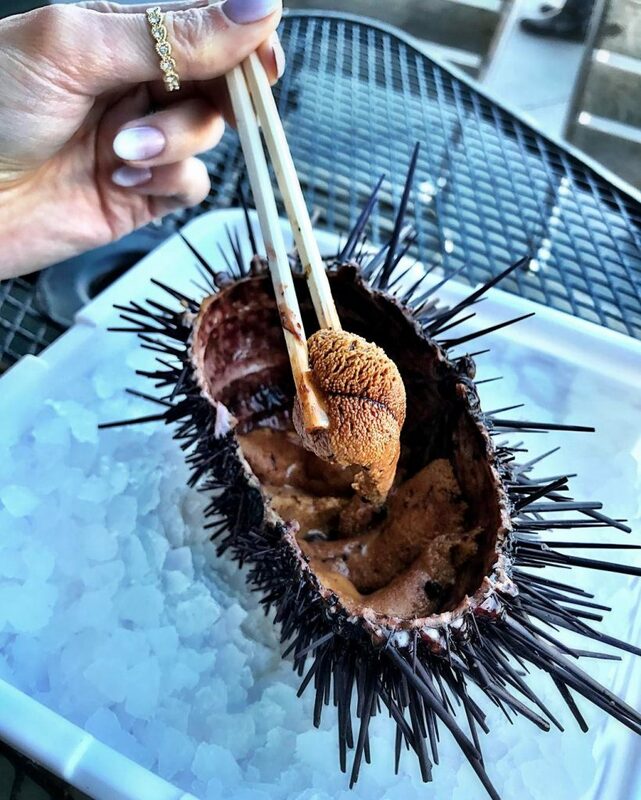 Like a badge of honor, visitors love to share their first time trying sea urchin. A local delicacy, this delight is not for the faint of heart. Head down to the Santa Barbara Harbor first thing in the morning to get the day’s freshest catch from local fishermen. They’ll teach you how to open and eat this one-of-a-kind seafood. Spruce up your food photography skills with an Eat This, Shoot That! food and wine tour. Offering two tour locations, choose to tour the top eateries of the Funk Zone or cheers to good wine at the tasting rooms of the Wine Collection of El Paseo. Expect to learn great tips and tricks to food photography – we guarantee you photos will look just as scrumptious (if not more) than your food tastes. Learn the tale of Santa Barbara’s wine country with a visit to The Valley Project in Santa Barbara’s Funk Zone. Told by a hand-drawn chalk wall, details of each Santa Barbara AVA (American Viticulture Areas) are displayed for all to see. Learn the differences in the rich minerals of soils that grow the vines, as you taste your way through each of these distinct growing regions. It’s more than the vines that make Sunstone Winery such an enchanting location. On a warm summer day, walk through the lush vineyards, picnic on the sprawling lawns and enjoy a game of bocce ball in between pours. This is a picture perfect wine country location that pairs well with Pinot and Chardonnay. If you ask us, the bakery owned by the main character, Jane, in the movie, “It’s Complicated” comes to life with Helena Avenue Bakery. From floral printed plates to delectable chocolate croissants, there’s something special about Helena Avenue Bakery. This location is just the spot for one of those infamous over-the-top table photos. Take your taste buds to the next level, with the French Toast Baguette or the Ham and Cheddar Biscuit Sandwich. Next up, Scarlett Begonia, where the cinnamon buns are everything and the outside patio is almost too cute to handle. The exterior decor includes pops of color and miniature succulents. Each table is already set for your next photo shoot. Located in Los Alamos, Bob’s Well Bread is about 45 minutes outside of Santa Barbara, but boy is it worth the drive. Top photo favorites include avocado toast topped with toasted pumpkin seeds and a poached egg and Pan au Chocolate, a flaky pastry oozing with chocolate. 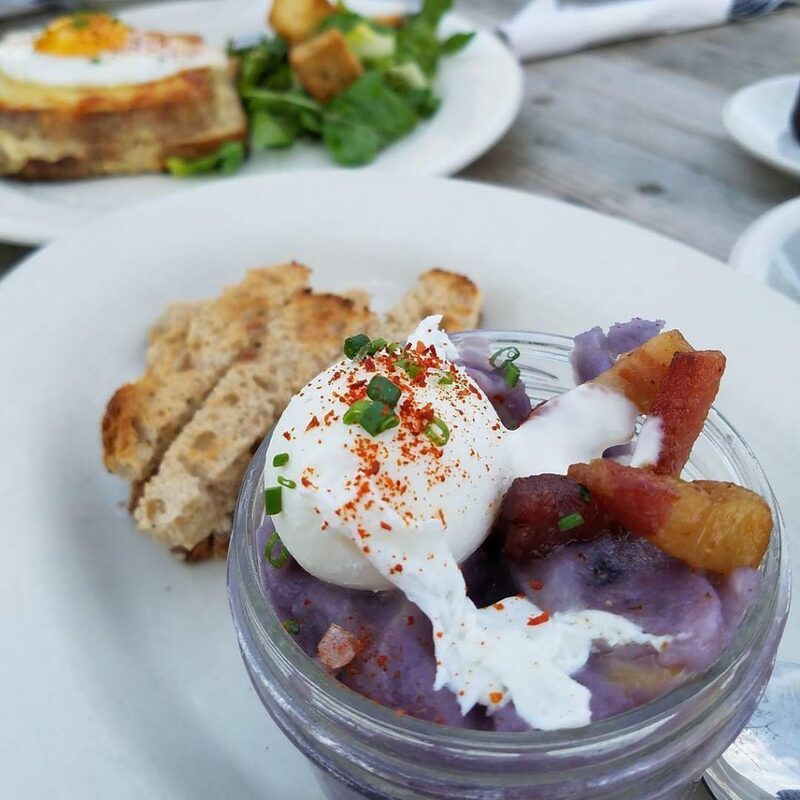 But the crown jewel of photo worthy pics, is the famed egg in a jar, complete with pureed purple potatoes, gruyere cheese, poached egg, and bacon lardons. Not all pools are created equal, and these Santa Barbara pools sure are show-stoppers. The zero-edge swimming pool at Belmond El Encanto is located between the lush green mountains and the dazzling blue sea. Before you head back to your private bungalow, lounge pool-side and gaze upon The America Riviera®. 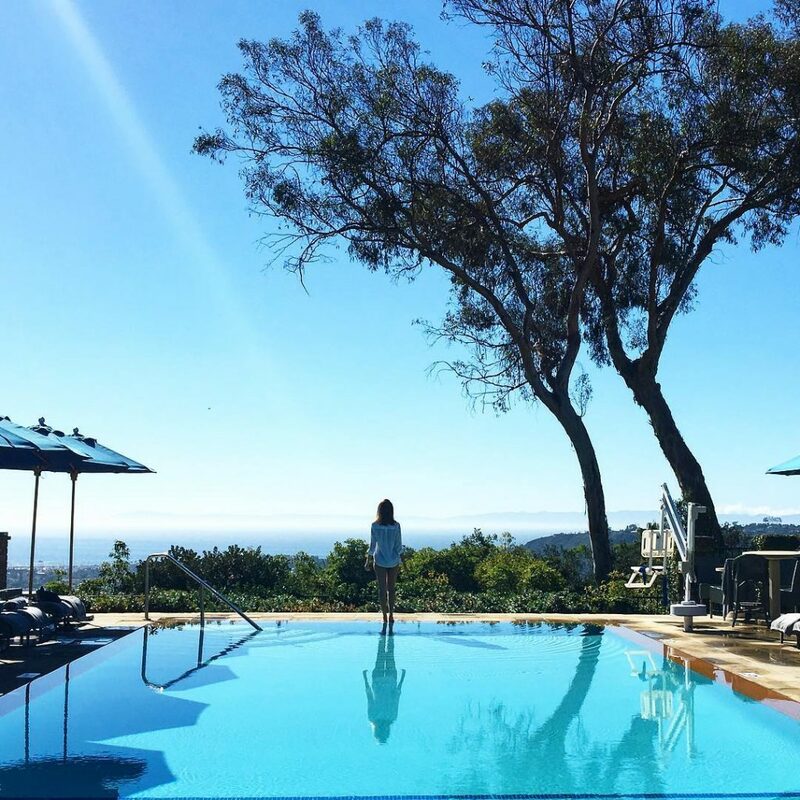 To achieve utter bliss at The Ritz-Carlton Bacara, Santa Barbara, poolside cabanas, mimosas with the girls and views of the Pacific Ocean are just what the doctor ordered. You’ll have to pinch yourself to believe that you’re actually experiencing such heaven. Tip: After spending the day poolside, get dressed up and dine at Angel Oak for a seafood and steak feast. Sit oceanside to soak up every last drop of sunshine. In the heart of Santa Barbara, there’s a roof-top pool unlike any other in town. Sweeping views of bustling downtown Santa Barbara surround the four corners of Kimpton Canary Hotel. Early birds can wake up to catch the sunrise or guests can linger a little longer in the evening to soak their toes in the hot tub, cocktail in hand. Jump, dive or belly flop. 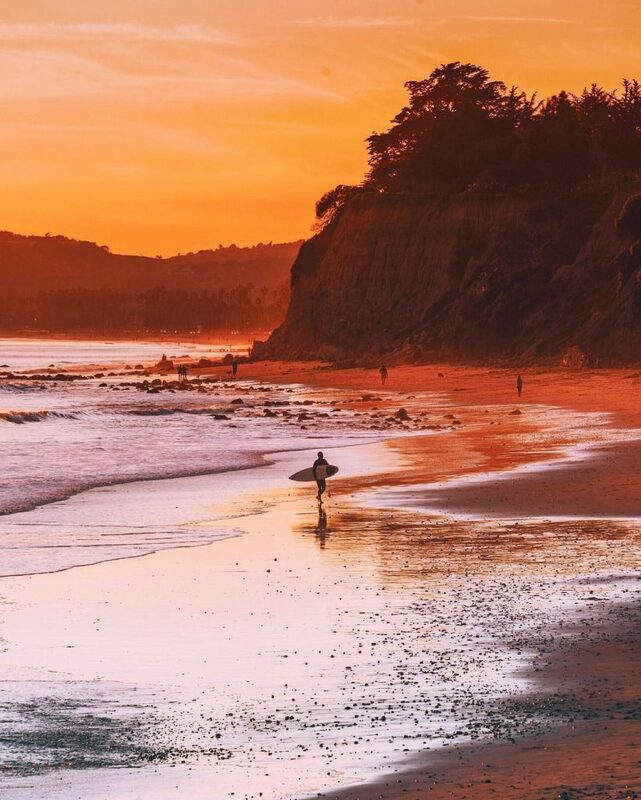 Morning noon and night, the beaches of Santa Barbara are always Instagram worthy. If you’re looking to find the best of the beaches, these are the shores that make for a post-card perfect view of Santa Barbara. Butterfly Beach in Montecito offers beach-goers everything you’d come to expect from a Santa Barbara beach. With a coastline that runs east to west, you’re not only guaranteed a swoon-worthy sunset, but just as stunning sunrises, often caught by early risers. It’s not just about the sunsets, Butterfly Beach is also a great place to catch a wave. Fill your frame with kayakers, surfers and stand up paddle boarders as they paddle out over the glassy waters. Always have your camera handy because you might just catch a pod of dolphins at play. With lush green hillsides and shades of ocean blue, never has a beach sparkled as much as Refugio State Beach. 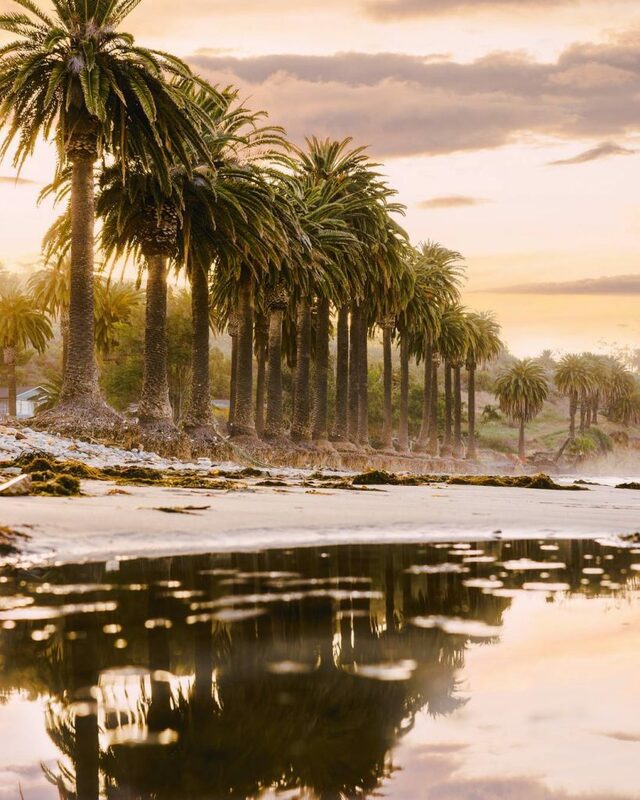 Located a quick 20 miles outside of Santa Barbara, pair your sunny day with a trip to this palm tree lined shoreline. Frequented by surfers, campers and day visitors, Refugio State Beach is a stunning sight to be captured. Other than a small camp store, this secluded beach is just the spot to post up for the day and soak up the beauty of the beach. For the quintessential beach photo, Shoreline Park provides a cliff-side panoramic view of Leadbetter Beach. From this top spot, you’ll see miles of coastline, the Santa Barbara Harbor and surfers riding along the waves. If you’ve got your pooch with you, take extra time to walk along the cliffs and down the stairs to the beach below. Hands down, the most Instagram-worthy experience of Santa Barbara is the nightly performance of the sun setting into the sea. As the sky turns into a vibrant ombre of colors, you won’t be able to resist capturing this beauty. The cliffside along Douglas Family Preserve is the ultimate spot to watch a Santa Barbara sunset. High above the sea, seat yourself at the end of the trailhead for a front row seat. Golden hour will never be the same! For a different perspective, surround yourself with the setting sun and cool breezes of the Pacific aboard the Double Dolphin. Cheers to a day well spent and let your cares sail away with the changing colors of the sky. If this list hasn’t inspired a trip to Santa Barbara, a sunset helicopter ride with Nanco Helicopters certainly will. It won’t take much to convincing to take this flight of a lifetime. Just look at the views you could be capturing!